Is a great way to experience the nightlife Sligo town has to offer, visit some of Sligo liveliest bars and restaurants while you do your tour complete with a night of Cocktails and Dancing with Live Music and Djs. 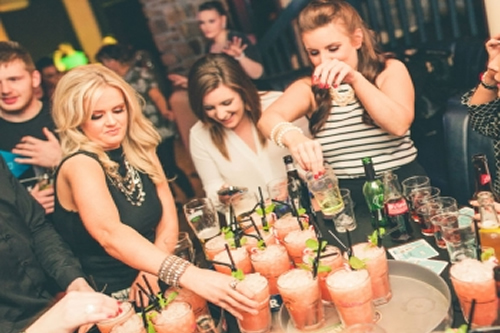 Sligo is now known as one of Ireland best Hen and Stag destinations with lively Night life with some of the trendiest bars all situated in the heart of Sligo town. With this package you get to experience two of the best, The Blind Tiger who just won Best Cocktail Bar in Connacht at The ICCA awards in Dublin in December 2017 and then you will also visit the Garavogue which is known as Sligo’s No’1 night time destination. Combine this with an evening meal and overnight accommodation in one of Sligo’s best hotels. With this package you will certainly have have a night to remember and let’s say even a few stories for the wedding day (or not). During this Hens’ night out on the town package, our city experts will guide you through where the best venues are, so you don’t waste any precious time trying to track them down and making sure you have the ultimate hen party night in the best venues with the most amazing atmosphere in Sligo best suited to you and your group even if in fancy dress.